The standard personal information file for each user includes the following fields: User ID, Name, Surname and E-mail. 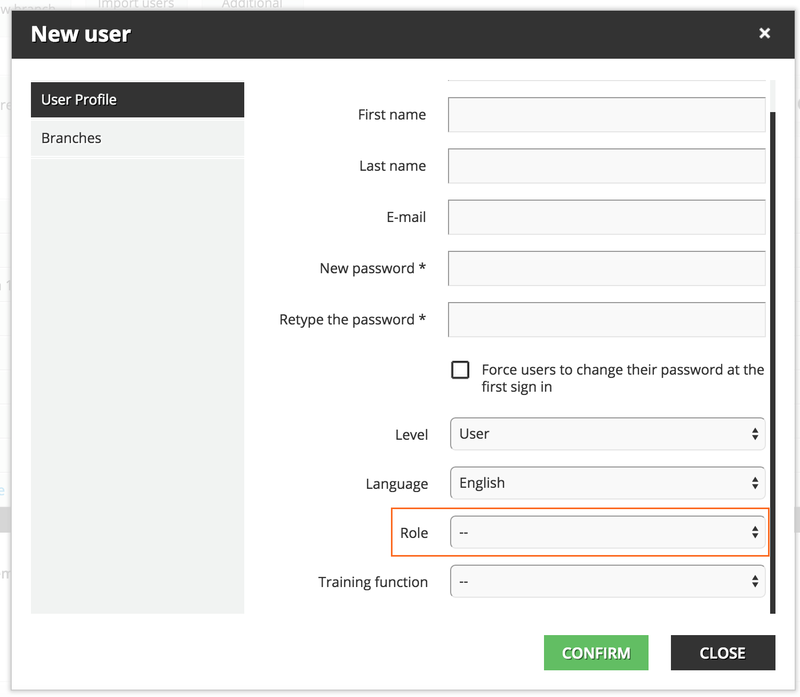 Often the company needs to increase the information for a user profile by creating user additional fields. To create user additional fields, log into your platform as the Superadmin. Then access the Admin Menu by scrolling your mouse over the gears icon in the left sidebar. In the E-Learning Section, press the Users item. 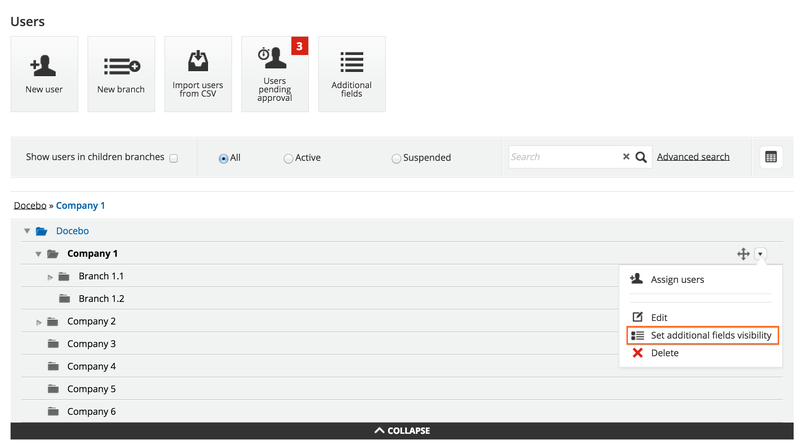 You will then be redirected to the main User management page, where you will see an action bar at the top of the page. Press the Additional Fields button in the action bar. Fiscal Code. This field checks if the code is properly formed. Country. This field provides a predefined list of countries. Date. This field provides a calendar. Now, select the Create button. Give a name and assign a language to each field, then flag whether the field is mandatory for users to fill out, or if it is Invisible to the user. Press Save Changes to finish creating the field. When you’re finished, check the Final Outcome. If an additional field was created after importing your users, the field will automatically be assigned to the master data file present in the platform. However, in order to update this content, you need to import a new .CSV data file for the new field, or you must create a request that prompts users to fill out the new field (if marked as required). You can do so from the Advanced Settings menu (Admin Menu, Advanced Settings). Then, in the Users tab, select the check box that prompts the user to fill in the new mandatory field. 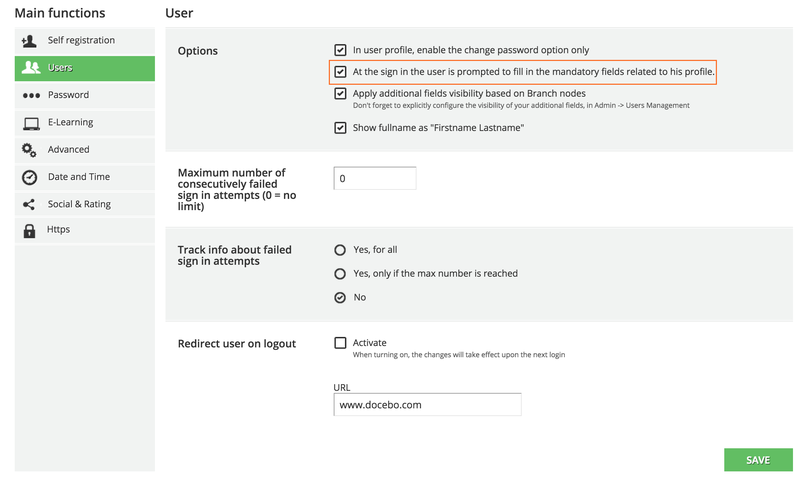 This feature is available only for Docebo 6.5 or higher. You can assign different fields for each branch of the organizational chart in order to optimize the users’ details related to different companies, countries, offices, or any other sorting category that you may use to classify your learners. After creating the list of your additional fields, you can choose which ones to assign to a specific branch of the organizational chart. To enable this option, select the Admin button, and choose Advanced settings. Then, reach the Users tab. Now, in the first section (Options), flag the option to apply additional fields visibility based on organization chart nodes. Now you can start customizing the fields for each branch. 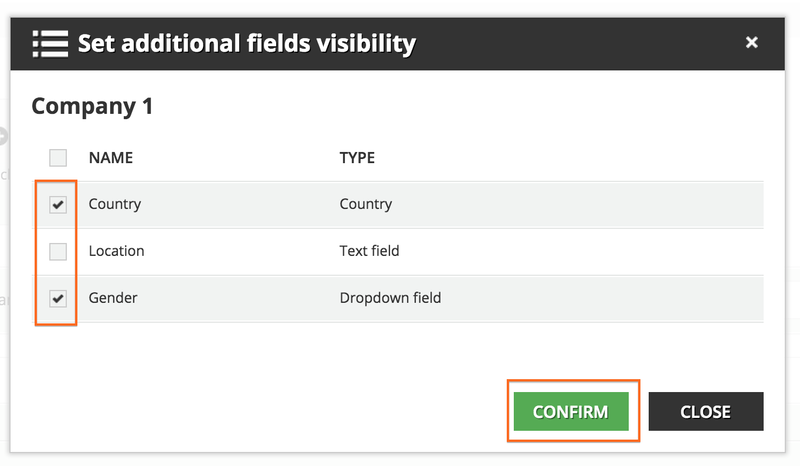 Select the folder you want to manage, then choose Set additional fields visibility from the menu. The platform will display the list of all of the additional fields available. Flag which ones you want to assign to the branch, then press Confirm. Now, these new user additional fields are only available for the users assigned to this branch. Repeat the operation for each branch of the organizational chart as desired.